Ensuring our guests keep their well-being is our daily mission at Shangri-La Hotel, Tianjin and for those who enjoy a weekend workout, we’ve added two new studio fitness classes at our Fitness Centre on level 3. Every Sunday from 15:00-16:00, guests and members can shape up with fit ball, an exercise class using inflatable fit balls to improve core strength, posture and body alignment. Following Fit Ball from 16.00-17.00, new Body Combat is a non-contact martial arts based workout designed to burn calories and stress as you have fun punching and kicking your way to health. The Fitness Centre also runs Yoga and Pilates classes throughout the weekend and weekdays, which are complimentary for all hotel guests and Fitness Club members. For more information, please contact 022-84188888 transfer Fitness Club. A living green wall marks the entrance to our Health Club, filled with invigorating natural light and magnificent views through floor-to-ceiling windows. 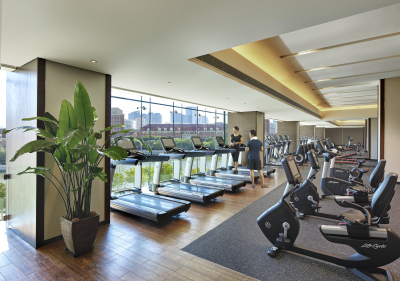 Be inspired by the expansive river and city panorama as you exercise with our extensive collection of Life Fitness equipment and free weights. 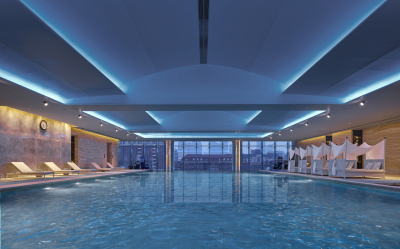 A fitness studio offering daily yoga and tai chi classes, plus two rooftop tennis courts are also available to guests. Trainers are on hand to assist health club members and guests, and the Body Composition Analyzer provides health assessments. A Jacuzzi, sauna and steam room offer retreat after your workout. A highlight of the Health Club is our spectacular resort-style swimming pool with an infinity edge overlooking the river. Underwater music speakers add to the enchantment as you swim.